Bluetooth Low Energy prototype showcase - "iPhone 4S - Canon DSLR - Remote"
The last few weeks we have been working with some very cool Bluetooth 4.0 Low Energy designs. Our prototype boards came in from the assembler about a week ago and we are happy to announce that they work perfectly :). Why we thought this is a good idea? Currently the DSLR remotes in the market are mostly directional. Carrying an extra remote is always a pain when your phone can do better. This adds extra functionality over a conventional remote by enabling you to program the camera into clicking automatic pictures. App updates will be pushed via the Appstore to add extra functionality to the remote over time. Depending on interest - we might open source the protocol in the future to connect to the DSLR dongle and you might be able to whip your own funky remotes. 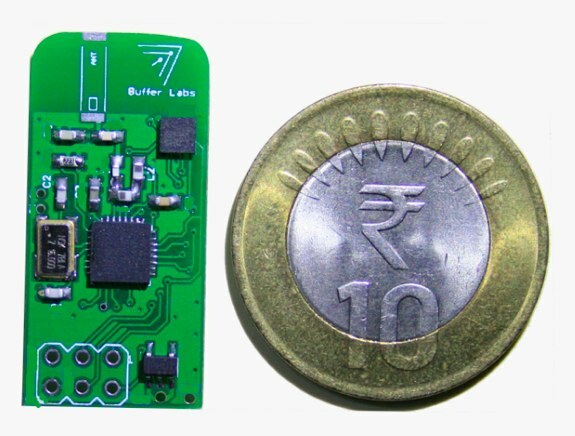 Bluetooth 4.0 Proto-board with an Indian Ten Rupee Coin for size comparison. No extra hardware needed for iPhone 4S/the new iPad for connecting to the accessories. No MFI license needed from Apple for producing these accessories. The battery life on these accessories is amazing - a single coin cell can last for about 6 months. The last few months have been rather fun and busy at Buffer Labs. We moved to Bangalore in November - Finally Launched our site and have a workflow setup that gets us from design to prototype in 2 weeks. Prototyping is an expensive affair in India - If you are a new startup make sure you have adequate budget set aside for whipping out at-least 4 new designs a month. Its way easier to deal with PCB fabrication plants that supply proper design rules than dealing with lower cost PCB manufacturers who dont provide design rules. It might be cheaper and more time efficient to get your boards done from a manufacturer abroad ( Our current favorite being Seeedstudio ) than to get it done here in India - We had a turn around time of 9 days from submitting the Gerbers online to getting the PCBs with us in Bangalore. Its always handy to have a trusted local PCB assembler - Our current turn around time in Bangalore for PCB assembly is 4 days for reasonably complex RF circuits with QFN components. Have good support teams for handling your accounts (Read CA on speed dial) and office refreshment needs [ :D ]. Lastly, friends and family before work - You never know when you might need moral/financial support [ ;) ]. Musings from Buffer Labs India.